iVogue, the fashion iPhone cases and covers website, has launched the new HEX iPhone 4 case, combining color and protection for the iPhone 4. 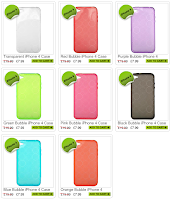 The HEX iPhone 4 Case is available in a range of exciting colors and brings a new dimension to iPhone 4 protections. Made from TPU Silicone the HEX iPhone 4 Case fits perfectly around the award-winning Smartphone, adding style and verve, whilst shielding against everyday knocks and bumps. The cases have an energetic translucent effect with a hexagonal pattern making them an ideal iPhone 4 case choice. HEX iPhone 4 is available exclusively from the iVogue website.